The mission of St. Bernadette Catholic Academy is to educate the whole child, fostering and stimulating in students an awareness of their Baptismal gift of Faith, recognition of their own God-given talents, and to empower students to mature into successful Catholic Christian adult citizens. St. Bernadette Catholic Academy is committed to building a caring, Christian community while providing a challenging, academic foundation for its students. We are devoted to fulfilling the educational mission of Catholic education. We believe that every facet of life is important – spiritual, moral, intellectual, emotional, social and physical. Our school fosters and stimulates in students an awareness of the gift of Faith, helps students grow in the appreciation of the Gospel, and empowers them to mature into responsive, Christian adults. 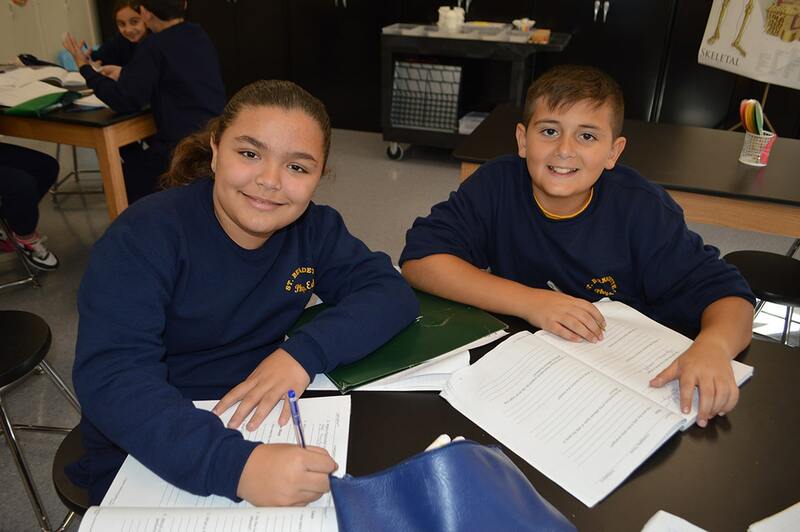 At St. Bernadette Catholic Academy we provide an atmosphere that combines academic excellence with the necessary skills for making moral decisions based on Catholic values and attitudes. We prepare our students to be responsible citizens and enable them to meet the challenges of the 21st Century. Knowledge is viewed as an essential component in a mature, critical-thinking adult. Therefore, each student is assisted in developing a positive attitude toward continued education, and is motivated to think objectively, resolve problems creatively, reason independently, and work collaboratively. Students are encouraged to develop skills for building a better world. Through their active participation in extra-curricular activities we acknowledge their positive contributions to school, parish and community. Through a structured physical education program, the students benefit from healthy competition, teamwork, and good sportsmanship. Relationships among students, families, and staff promote and support loyalty and respect within the school environment, which, in turn, create a vibrant rapport at St. Bernadette Catholic Academy. As a school within the Diocese of Brooklyn, our curriculum guidelines are based on New York State Next Generation Standards. These guidelines form the framework upon which we base our instruction. They are strengthened by the leadership of our local administration and enhanced by the professional and personal commitment of the school faculty and staff.